The battle of Chinsurah is also known as the Battle of Biderra. The battle took place on 25th of November 1759 near Chinsurah during the Seven Years War. It was fought between the British East India Company and the Dutch East India Company. The forces of the Dutch East India Company were invited by the then Nawab of Bengal, Mir Jafar. Mir Jafar had siezed the throne as the Nawab of Bengal by betraying Siraj Ud Daula. Since then, he had been under the influence and power of the British East India Company and wanted to get out of their claws by any means necessary. Therefore, he sought help from the Dutch East India Company. Now the British and the Dutch were not at war with each other. Despite this, the Dutch forces moved up the Hooghly River in Bengal. There they were met by the British forces which contained a mixture of European and local troops. The two forces met at Chinsurah which is located just outside Calcutta. The British forces won the battle and were led by Colonel Francis Forde. The naval vessels which were used by the Dutch to deliver the troops to the battlefield were defeated in a separate battle on November 24th. In 1757, the French outpost at Chander Nagore was captured by the British East India Company. This was too much for Mir Zafar who had danced enough on the Company’s whims. So he decided to ask the Dutch East India Company for help. He promised them that he would help in bringing their troops into the area in secret meetings and negotiations. The countries of Britain and Dutch Republic were at peace at that time but tensions were rising due to the Seven Years’ War. Moreover, the hero of the Battle of Plassey, Robert Clive was busy fighting the French. Seeing such a good opportunity, Dutch leaders at the outposts of Chinsurah decided to make good use of it and expand their influence in the area. They sent additional troops to Chinsurah which contain a fleet of 7 ships, which consisted of more than 1500 European and Malay troops. These soldiers came from Batavia. They reached the mouth of the Hooghly River in October 1759, when Mir Zafar was in a meeting with Robert Clive in Calcutta. Mir Jafar had been forced to take help from the British East Indian Company so that he could tackle the threats on his Northern borders. In his meeting with Robert Clive, he promised that upon his return to Hooghly, he would ask the Dutch to leave immediately. After his meeting with the Dutch directors at Hooghly, Zafar informed Clive that he had given the Dutch some special privileges for the meantime and their ships would leave as soon as circumstances would allow. But Robert Clive was very cunning. He figured out that the Dutch were recruiting around the areas of Chinsurah and hence he treated this situation as a real military issue which gave him ample amount of time to prepare for the threat. Clive had four naval ships at his disposal out of which he sent one to request the assistance from Admiral Cornish who was at that time, patrolling the eastern coast of India. However, this ship was captured by the Dutch forces. Clive rolled out the military calls for volunteers who would fight alongside him. He increased the fortification on the river and sent Colonel Francis Forde with only 500 soldiers towards Chandranagar. The main objective to send Francis Ford was to capture the Dutch outpost which was located at Barnagore. This was to prevent the Dutch from capturing Chandranagore if they tried to do so. On 21st November, Dutch troops landed on the northern shores of Hooghly River, just outside the range of the English river batteries. They started their march for Chinsurah. After the capture of one of the British ships, Clive was left with only 3 vessels named as the Duke of Dorset, the Calcutta and the Hardwicke. These three vessels followed the Dutch ships up the Hooghly River. Once the Dutch ships had deployed the troops on the coast they began moving down the stream. On 23rd November commander of the British flotilla, Charles Wilson, indicated to the Dutch ships that he wanted to pass them. The Dutch Ships threatened to fire upon the British ships if they tried to do so. Clive sent an ultimatum to the Dutch stating that they must retreat from the outpost which the Dutch had captured. This ultimatum was rejected and on the following day, the two naval fleets engaged in a two hour battle. Consequently, the Duke of Dorset defeated the Dutch flag ship vessel Vissingen, and Hardwicke and Calcutta grounded another ship having chased down two other fleeing ships. The reinforcement British ships moved up the mouth of Hooghly and captured the fleeing ships. On 24th of November, the infantry divisions of both the Dutch and British East Indian Company engaged in battle. British forces were led by Colonel Forde. 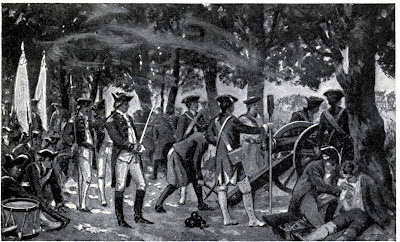 Forde pushed the Dutch forces back to Chinsura and captured the Dutch artillery. Soon enough, Forde received reinforcements from Calcutta which increased the total size of his army to 1200 soldiers. Mir Zafar also sent 100 cavalry riders just to pretend to be helping out the British forces. But in truth, they were instructed to just observe from the sidelines and support whoever was victorious. Colonel Forde learnt from the prisoners of war that the Dutch would be receiving reinforcements the next day. He immediately sent word to Robert Clive asking for his advice on the matter. He was of the opinion that fighting the Dutch reinforcements would be considered as an act of war between the two countries at a time when they were at peace. Robert Clive simply wrote back, "Dear Forde, fight them immediately". Colonel Forde, having received clear and concise instructions from Robert Clive, chose the plains of Biderra as his forte. It was located between Chinsurah and Chandernagore. At 10 o'clock on the morning of 25th November, the Dutch forces arrived and marched through the center of the village of Biderra. As soon as they entered, Forde ordered his artillery to attack. The Dutch soldiers kept moving forward in spite of heavy artillery strikes. When the front of the attacking army reached the center of the field, they found themselves facing a wide ditch which had been prepared by the British on the previous night. They got confused and stopped. Once the front of the force had come to a halt, the rear still kept pushing forward, creating an environment of utter confusion. Meanwhile, Forde ordered his infantry to fire upon them with muskets as they were in range. Before the Dutch could understand that they had to retreat, they had already suffered huge losses. But Forde was not done with them yet, he sent out his cavalry after the retreating soldiers to finish them off. At this time, the 100 cavalry men sent by the Nawab were asked to attack too, but they remained put. They only joined the fight when a second wave of cavalry was sent after the retreating Dutch. The defeat for the Dutch was so appalling, that only thirteen European soldiers managed to return alive from the battle. This was a huge victory for the British East Indian Company. Mir Zafar was replaced by his son in law after his Betrayal was discovered and the British further strengthened their position in the Bengal region.